Does Signing a Prenup Affect My Rights Under My Spouse’s Will or Trust? Florida estate planning typically involves executing a will or trust. But there are other legal documents that can affect your estate plan as well. If you are married–or about to get married–you and your partner may wish to have a prenuptial or postnuptial agreement in place. Although we usually associate such agreements with divorce, they may also address the disposition of property upon the death of either spouse. Assuming the prenuptial or postnuptial agreement was validly executed in accordance with Florida law, a probate court will enforce its terms after a party’s death. This is why it is essential to review and understand the terms of such agreements beforehand. 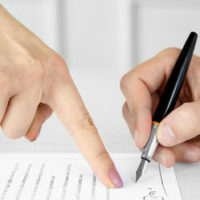 You may be signing away certain legal rights under Florida probate law. Consider this recent Florida appeals court decision. The parties in this case are the widow of a man who passed away in 2013 and the co-personal representatives of his probate estate. In 2009, the widow and the deceased signed a prenuptial agreement. Under its terms, upon his death his estate would purchase the widow’s interest in the marital home and pay her a “lump sum” of $500,000. The husband’s Florida estate plan also created a marital trust, from which the widow would receive income during the remainder of her lifetime. The prenuptial agreement went on to say that so long as both sides followed these terms, the widow would “refrain from any action or proceeding to void or nullify to any extent the probate of or the terms of any last will and testament or trust” of the husband. Despite this language, the widow attempted to initiate a probate proceeding to remove the personal representatives of her husband’s estate. Although the estate purchased the widow’s share of the marital home and paid her the lump sum as directed by the agreement, she accused the personal representatives of breach of fiduciary duty with respect to the marital trust. The estate replied the prenuptial agreement barred the widow from making such a claim. The Florida courts agreed. The Florida First District Court of Appeal, rejecting the widow’s second attempt to force the removal of the personal representatives, bluntly called the widow’s lawsuit a “sham.” The prenuptial agreement “expressly provided” that neither spouse would challenge a will or trust made by the other “regardless of whether they were executed before or after the premarital agreement.” The widow tried to avoid this restriction by omitting any mention of the premarital agreement in her second lawsuit, which led the court to declare it a sham. Never assume that your estate plan overrides or negates prior language in a pre- or post-marital agreement. Indeed, your future probate estate may be subject to many types of contracts executed during your lifetime. This is why you should always work with an experienced Fort Myers estate planning attorney who can ensure your legal affairs are in proper order. Contact the Kuhn Law Firm, P.A., at 239-333-4529 to schedule a free initial consultation with our office today.